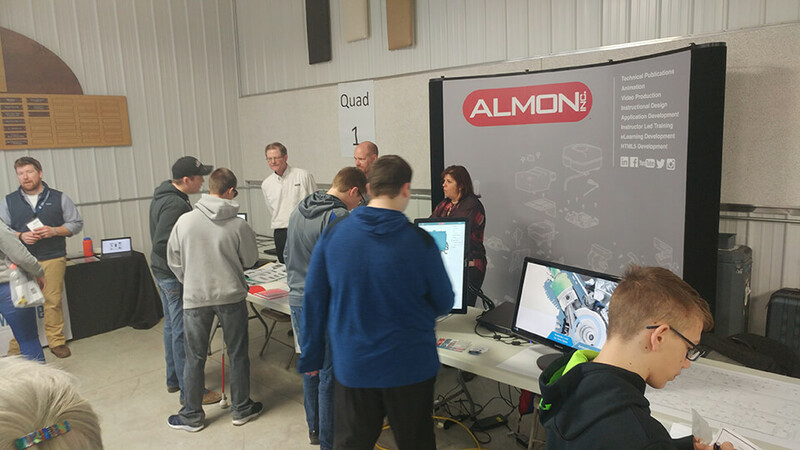 On Tuesday, February 27, Almon participated in Lancaster Community Schools’ Career Exploration Day in Lancaster, WI. Approximately 36 businesses and military services were represented. Almon, represented by Renee McCartney, Justin Rath, and Tom Weber, presented our graphics, technical documentation, and animation careers respectively. Examples of illustrations and manuals were on display as well as active animations and an app that students could interact with on a touch screen. It was difficult to explain in very few words and noisy environment what each person does at Almon, but having tabletop visuals that were “exciting” or “techy” helped grab the attention of the high school students! 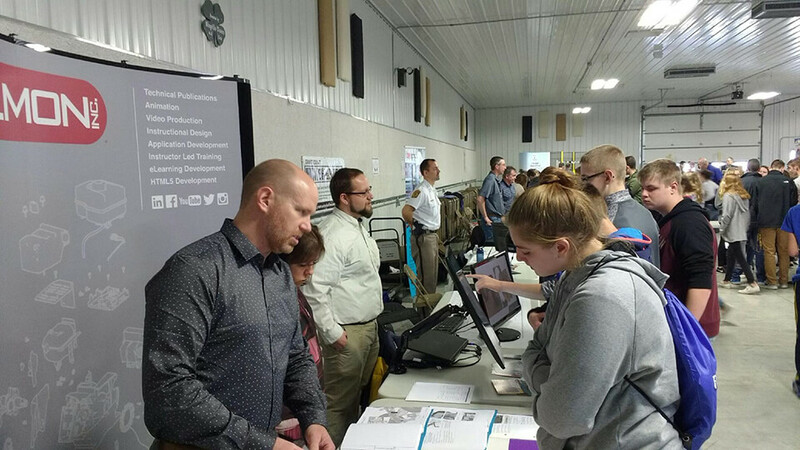 Justin Rath, Dan Roling, Renee McCartney, and Tom Weber represented Almon at the Lancaster Community Schools’ Career Exploration Day. 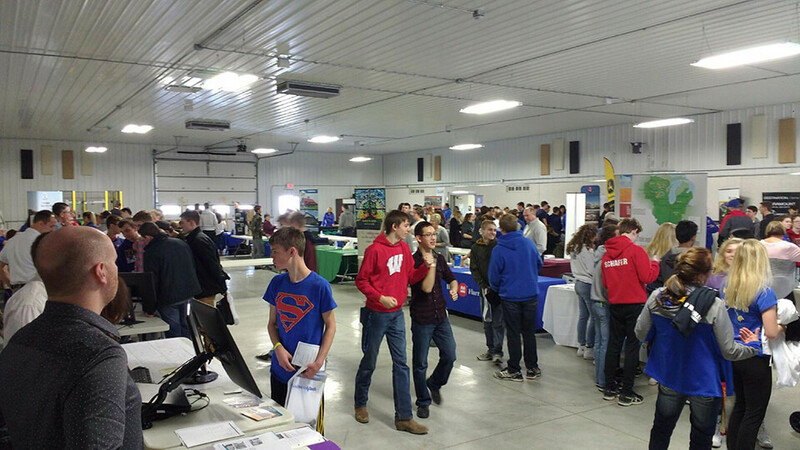 The goal of the event was to help high school students get a view of the broad spectrum of careers and pathways in today’s world and learn about some of the specialties of those pathways. 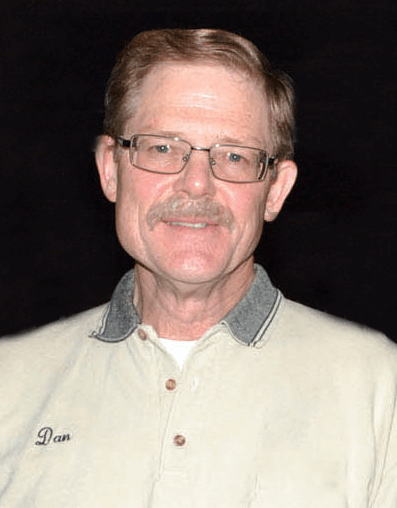 Financial, health care, agriculture, manufacturing, military and government, education, hospitality, and training were the many career paths represented. A quote on the students’ brochure: “Don’t pursue your passion. Chase opportunity and take your passion with you.” – Mike Rowe, television host of Dirty Jobs and Somebody’s Gotta Do It series. Students that stopped by really seemed to be interested in Tom’s touch screen app and animations. The schematics and manuals intimidated students a bit, but when explained that it was just like a big jigsaw puzzle, they seemed to relate better. We feel that our group represented Almon well and got a few kids thinking about technical positions in their future and about what Almon has to offer. 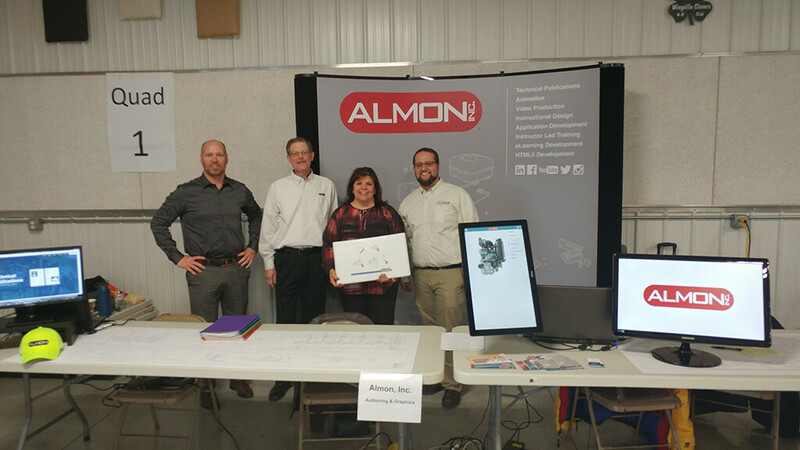 Renee, Justin, and Tom all enjoyed the day and the opportunity to share with others what they do at Almon Inc.! PreviousPrevious post:The ARA Rental Show in New OrleansNextNext post:Where Are the Technonicians?